The B18 Concrete Mounting Base secures a UT20 or UT30 tower to a concrete pad. The B18 consists of the hardware that is set into the concrete as the base is being poured. When using this base, our UTGUY Tower Guy Kit is recommended. The B18 consists of three steel tubes and three hinged connection assemblies. Each hinged connection assembly includes one steel sleeve, two steel plates, two grade 5 bolts, and one washer. 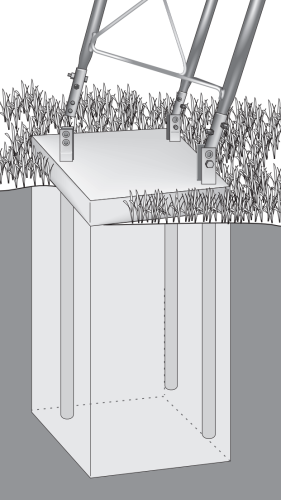 The tower legs fit into the steel sleeves, and the hinged connection assembly attaches to the steel tubes via the washer and bolts. The steel tubes are then embedded in concrete.